Week 25: The Easter Bunny. 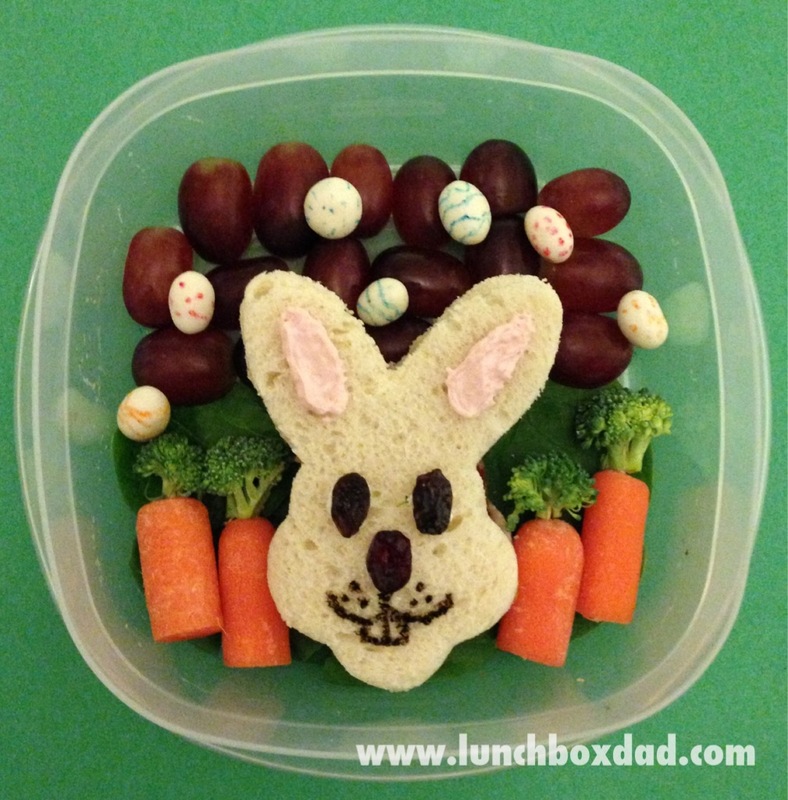 I wanted to do an Easter themed lunch this week for my daughter and also give you readers some inspiration for lunches of your own. I was reminded this week that even if you don't have school age children, these ideas can be great for birthday parties, play dates, and more. I tried to incorporate bunny and egg themes into this lunch to make it festive. Have a fun Easter! CLICK HERE to see the video tutorial for this lunch, see how easy it really is to make! 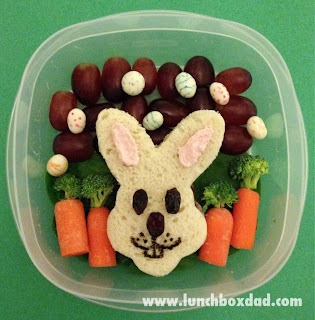 Use cookie cutter to make rabbit shape from two pieces of bread. Spread peanut butter and jelly on bread and press together to make a sandwich. This sandwich would also work with cheese and lunch meat. Dip two raisins in cream cheese and place on rabbit face to make eyes. Repeat with dried cranberry for the nose. Use a small amount of black food coloring on a toothpick to draw the mouth. Spread strawberry cream cheese on each ear for decoration. Cover the bottom half of your container with spinach leaves. Put the rabbit sandwich in the middle of the container with the bottom of the sandwich touching the bottom of the container. Place four baby carrot pieces vertically along the bottom of container on either side of the sandwich. They should look like they are growing out of the ground. Put a very small piece of broccoli on top of each carrot for the leaves on top. Cut grapes in half and use them as a background on the upper part of your container. Use food color to decorate yogurt-covered raisins so they look like Easter eggs. Scatter them around the sandwich on top of the grapes. Finish by having fun serving and eating it! I love that you drew on the yogurt covered raisins to make them into mini Easter eggs. Very cute! Thank you, I wanted to incorporate easter eggs into it somehow. I thought about using grapes as Easter eggs, then realized it would be too hard to decorate them and used them in the background instead. Thanks Jenn, I look forward to checking out your blog! Toothpicks are awesome, to me they are the most indispensable tool I have. I couldn't do lunches without them. First Lunchbox Dad Video Tutorial!